Hello all, new member here. We recently purchased an 1870s house in NH. This is my first experience with a steam system, so I'm trying to get our heating system working as intended. We have mostly two-pipe radiators, a couple one-pipe radiators, a convector, and a couple of baseboards thrown in. The boiler is a Megasteam that looks to be about ~5 years old and is in good shape. The piping is probably less so! I can't seem to locate a main vent on the system. I've followed all of the exposed piping in the basement and there doesn't appear to be anything that looks like a vent. I'm not sure if it's somewhere else or if it's possible that there isn't one at all. We started off with some radiators not heating up at all and other clanging and whistling. Having read through the advice here, I've replaced most of the air vents that were old and reduced the boiler pressure down to 0.5 with a diff of 1 on the pressuretrol. That has reduced the clanging and whistling, and we have more even heating across the radiators. However, the convector and downstairs baseboards still refuse to heat up and now occasionally on long heating cycles, I find steam escaping from the air vents on all the radiators at once. I don't really understand why this would happen. 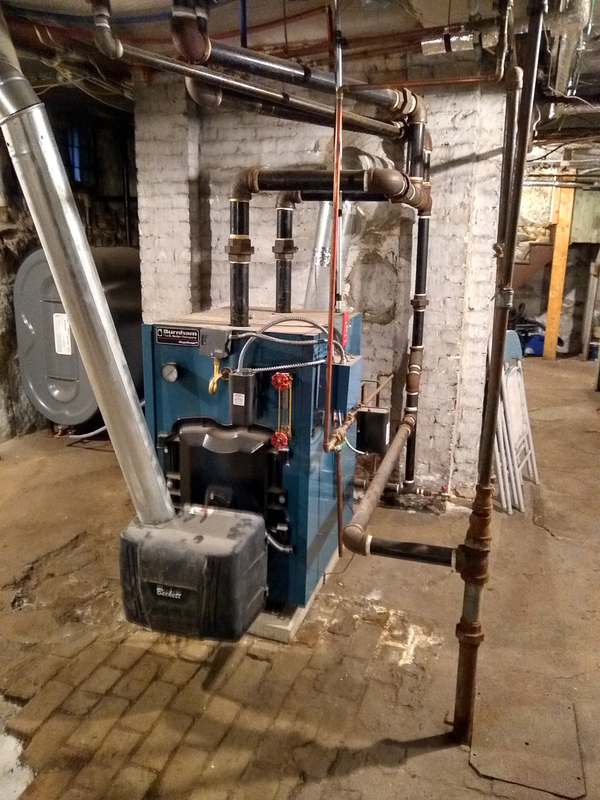 We've also heard what sounds like a sound of water rushing in the basement after these cycles, which I'm guessing is the sound of water being added to the system to replace the steam that is being vented? Apologies for any naive questions. I'm not sure how to diagnose and would love advice! It is very possible there are no main vents on the mains. There must be venting, either on the mains or the returns, depending on the type of two pipe system you have. Post some pictures of your boiler and the piping and any unusual contraptions that might be on the piping or near the boiler. In the mean time, make sure the pigtail that your Pressuretrol is mounted on isn't clogged. If it is clogged, it will let the system pressure build higher than the radiator vents can handle and they will open. Also, make sure all the two pipe radiators are pitched towards the return side of the radiator and all the one pipe radiators are pitched back towards the supply valve. I am assuming the two pipe radiators don't have vents on them, right? If they do, post a couple pictures of the radiators as well so we can see what you have. Most two pipe systems have traps on the return side, at the floor. Those traps, if working keep steam out of the returns. Very important. Thanks for your comments Fred! The two pipe radiators that we have actually do have air vents and they seem to have two standard valves for the in and out pipes rather than a trap. The pitch seems to be okay on the radiators, though I'm not sure how to check it for the convector or the baseboards (which seem to be a large part of the issue with banging as far as I can tell). I'm attaching a picture of one of our radiators and 3 pics of the boiler (one from each side) showing the controls and near-boiler piping. EDIT: apologies for the somewhat fuzzy pics, I can retake those if more detail is needed! Looks like a two-pipe air vent system. Keep the pressure down to ounces, using a vaporstat, and a low pressure gauge, graduated in ounces, alongside the standard, but useless required 0-30 psi gauge. Find a place in the supplies after the last radiator, where a main vent, such as a bigmouth can be tapped in, as the radiator vents cannot be able to allow the air to escape without burning extra fuel to force it out. Finally, adjust the inlet valves in small increments, to limit the amount of steam coming into the radiator. Open the outlet valves all the way. 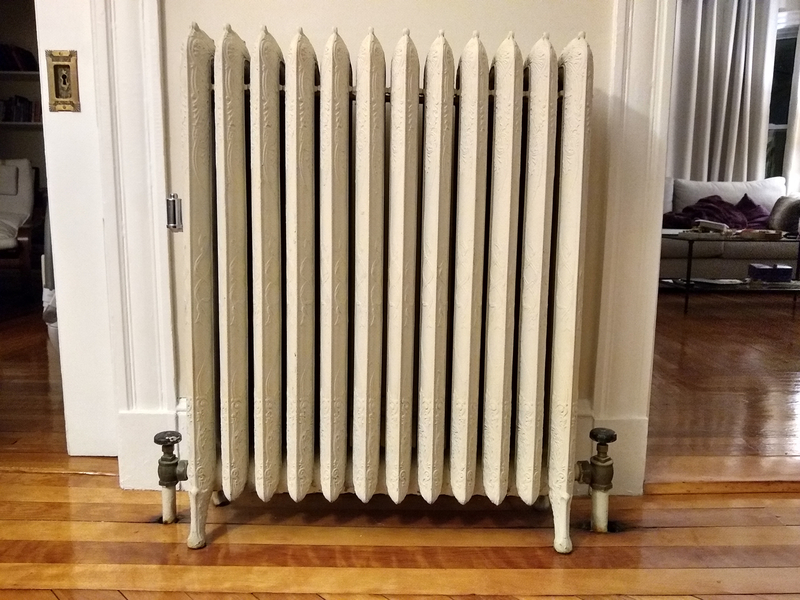 The radiator should just have enough steam in it to keep the outlet valve only condensate warm, and not steam hot when it is very cold outside, and the boiler is working hard. Caution everyone not to play with those valves on pain of death! Yes, a two pipe air vented system. Rare but legit! The boiler piping looks pretty good too. Like someone actually read the installation manual. The Gifford loop looks pretty high but I'm not sure if that poses any problem. You do need some venting but I'm not sure if that should be on the mains or on the dry returns. @Steamhead and/or @Jamie Hall can best look at this system and offer some advice. I see in the photos that you have two returns which are tied together below the water line -- as they should be -- and then feed into the Gifford loop (which is fine where it is). Ideally they would each have a main vent, as well as one on the steam main(s) -- but I don't see a particularly simple place to install one. Are there any handy dandy unions back along the return piping somewhere? I see 2 dry returns dropping down, but is there also a wet return coming up from the floor? To the right from the front of the boiler, there is a pipe coming up from the floor. There is a metal plate on the floor. Is that also a return? I will check on the Pressuretrol pigtail as soon as I can find instructions on how to do so. I have not tried closing the inlet valves partially, since most of the advice out there says keep them either fully open or fully closed, though I suspect that applies mostly for a single pipe system. I will try partially closing the radiators that are most prone to vent steam. About the returns, yes the pipe coming up from the floor appears to be the main wet return. The two pipes coming in from above are from individual radiators on the first floor. The returns from the other 10 units go into the floor, presumably meeting the buried wet drain there. Given that the wet drain seems to be mostly buried, I'm not sure there's a lot of opportunity to put vents on the return side, so the idea of putting it on the supply pipe after the last radiator seems like a good option. 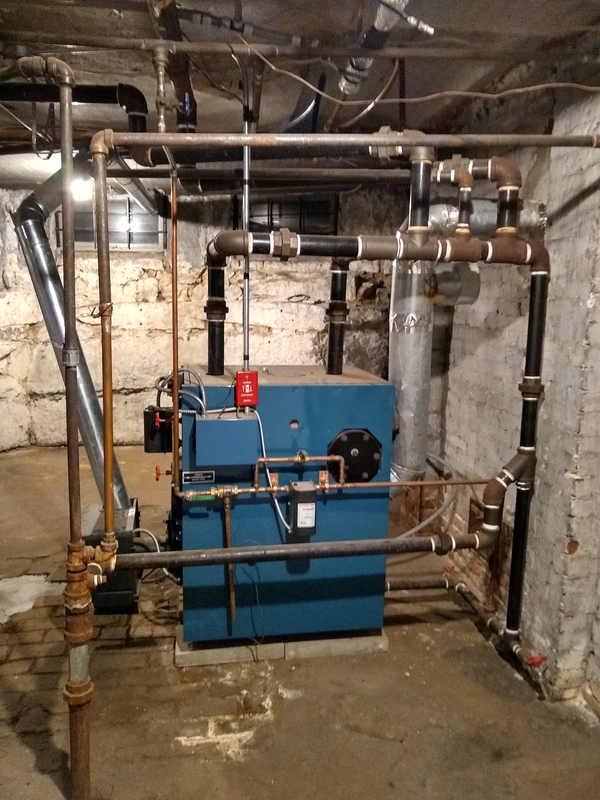 On the note of adding a vent and a vaporstat and evaluating the burner, there are no contractor listings in NH in the directory, and none of the contractors that I have reached out to in MA have been willing to drive to Manchester (~25 min north of the MA/NH line). 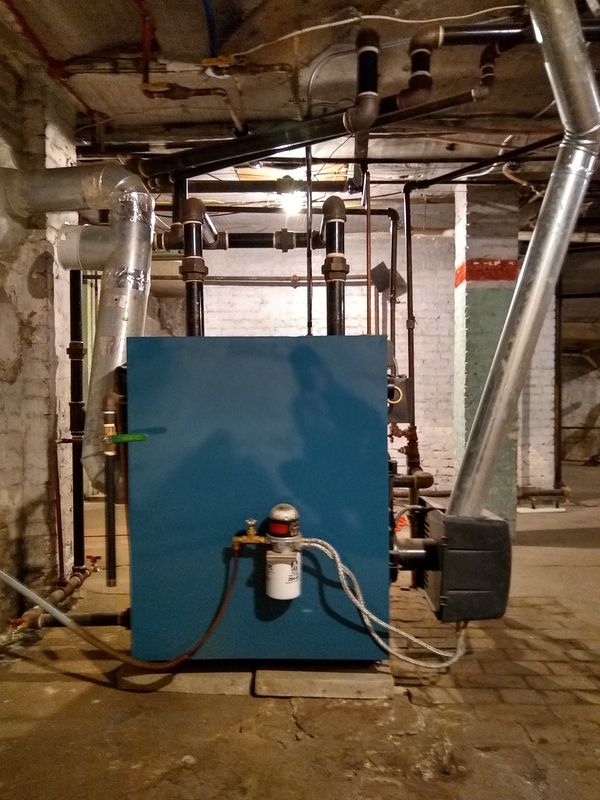 We'd also love to evaluate converting from an oil to a gas burner for the system, as we do have a gas line run to the house but are currently paying for oil. Does anyone have a recommendation for someone who does good work on steam systems out in our direction? Does each radiator return drop down into the wet return by itself? The downstairs radiators all seem to have individual drop downs (except the convector and one baseboard, which share a set of pipes, and one single-pipe radiator downstairs), but I can only find two sets of pipes going to the upstairs, so the 5 radiators up there have to be sharing some returns. OMG!!! We found a steamer that was piped correctly!! You may benefit by trying to add a main vent on each of the two risers going to the upstairs rads, but perhaps not, maybe just aggressive radiator vents like a Gorton C or D on each rad to expedite steam delivery to the upstairs. Main vents are critical for efficient operation of the system and should be installed on the supply main, after the last radiator takeoff as others have said. Not too familiar with two pipe systems with air vents on the rads, but it may be possible that there are orifices in the supply or return connections to the rads that already limit the amount of steam going to each one. Try doing as Nicholas Bonham-Carter suggested and turning the supply handles down to limit the amount of steam. If it doesn't really make a difference until you actually turn the radiator off, you likely have orifices installed and can just open the valves all the way and let the orifices do the limiting. FYI unfortunately, the Megasteam (while being one of the best steam boilers out there for any fuel) is not convertible to gas as per Burnham at this time and would void the warranty. (If this has changed someone please let me know!!). A common problem with old steam systems with buried returns is that they have a tendency to leak after 100 years or so of being full of water. You can check this by turning off the water supply to your boiler (after verifying that the low water cut off is in good working order and functioning properly) and monitoring the water level over a period of a few days. If you are losing water and it is not showing up anywhere, it is likely that you have some leaks in that buried wet return.